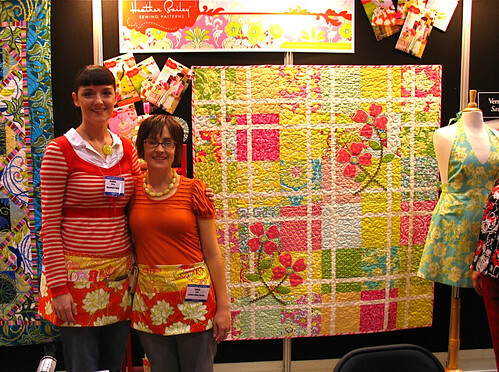 Saturday Quilt Market finale - Stop staring and start sewing! The winner of Thursday's beautiful quilt pattern is Allison (yes you, Allison!) who lives in a 100 year old house in Washington (perfect setting for a new quilt)! Congratulations Allison! Well I decided to save all my Bailey pictures for the last day. There is so much talent in their family that I think they should start calling it the Bailey Quilt Market. 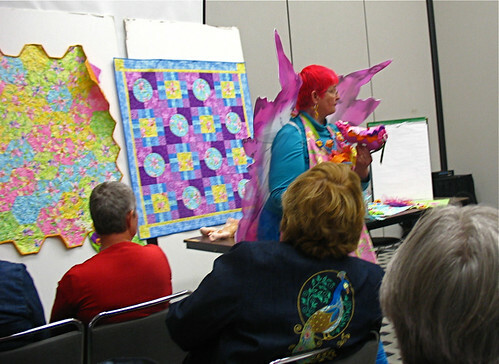 Elinor Peace Bailey did a great presentation on her new fabric line called Dance with the Fairies. When I was downloading these pictures Skate saw this one and yelled "butterfly!". Elinor brings a rainbow of colors wherever she goes. 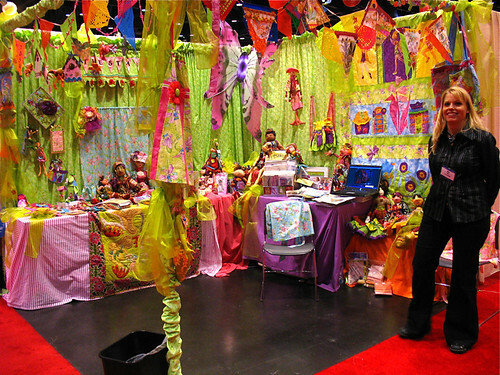 Here is a picture of her booth with the beautiful Beth (her partner in business). :) Do not try to adjust the color in your monitor, the picture is accurate. 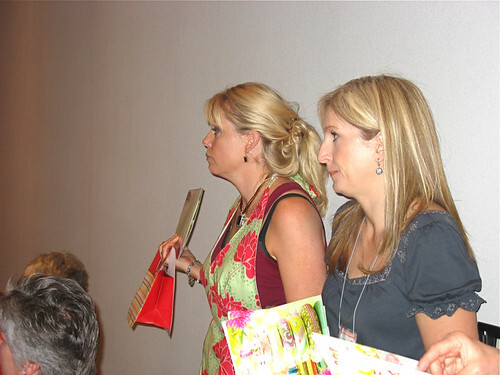 Here are Beth and I teaming up to collect business cards for Heather's pattern give-away. I know, our enthusiasm is infectious isn't it? And the matching hair, pure coincidence. Really. Heather debuted her pattern line (Beth is wearing the apron) and I'm thrilled to have them in the store now! Here are Heather (Elinor's daughter-in-law) and Laura Gunn (Elinor's daughter) at Heather's display in the Westminster section. Laura is working on a fabric line for the folks at Michael Miller and I can't wait to see it! And here's a peek at some fabric I ordered. 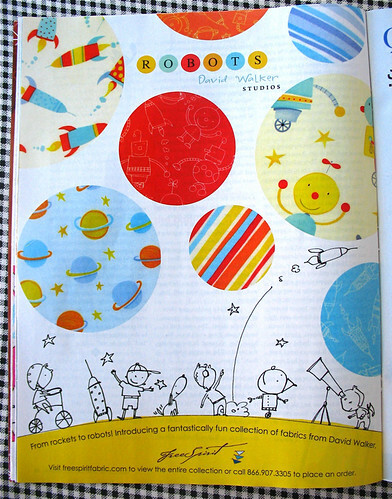 It's Robots by David Walker and I just love it because it's fun for boys (robots, rocket ships, planets, cool!). And here's the big, end of the week give-away! 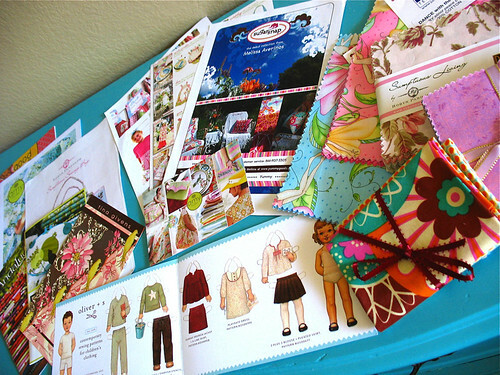 Pay attention because it's a lot of stuff: 1 Sugar Snap by Melissa Averinos fat quarter stack, 1 Robyn Pandolph charm pack, 1 Fairy Frost charm pack, 2 gorgeous stacks (about 8"x8") of Elinor Peace Bailey's new fabrics, a huge stack of eye candy including a quilt pattern from Amy Butler and a bag pattern from Robyn Pandolph and paper dolls from Oliver and S. (plus a bunch of pretty brochures that are just plain fun to look at). Good luck! And remember, everything in my store is 15% off through this Friday (the 7th)!